Luke 2:25 – And behold, there was a man in Jerusalem whose name was Simeon, and this man was just and devout, waiting for the Consolation of Israel, and the Holy Spirit was upon him. Consolation of Israel – The comfort of Israel in the midst of their distress. Their long awaited Messiah and deliverer. Israel had suffered greatly under the oppressive regimes of Egypt, Babylon, and Rome. When the captivity was like iron bars, when their rulers were cruel, when taxation drove them to poverty, when the oppression was relentless; they took deep comfort and encouraged each other continually in the truth of God’s promised Messiah; even swearing by the truth of His promised redemption saying things like “by the Consolation of Israel, I will do thus and so”. Messiah would come and save them one day, and this was a comfort sewn into the very fabric of the nation. And Jesus IS the manifestation of Israel’s long awaited consolation. Many today have a special place in their heart for the Jews and the nation of Israel. Just as Jesus is your hope and redeemer, He is theirs. You need not be intimidated by their claim to be “God’s chosen people”, like there’s something special yet to happen for Israel. Jesus IS their Messiah, and He IS who they’ve waited thousands of years for. In Luke 2:25, Simeon, by the power of the Holy Spirit, bears witness that Jesus IS the long awaited Consolation of Israel. And He is the same for all nations, tribes, and tongues! Ambassador of God, you may be confident that Jesus is the Jew’s Messiah. You may boldly declare this to be true without excuse or cowering under the intimidation of being called an anti-Semite or some other anti-Jew term. By telling the truth of who Jesus is to Israel and to all nations, you will be declaring the truth that Jesus is the Consolation to everyone who is captive, impoverished, enslaved, or oppressed in any way. Be bold about it…be bold about HIM! This entry was posted in Encouragments, Jesus is... and tagged Consolation, Israel, Jesus. Bookmark the permalink. 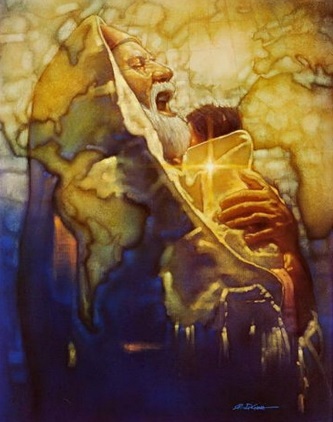 Could you tell me who the artist is in the painting above of God holding Jesus? I love it and would like to track it down! I’m sorry, but I don’t know who the artist is. I just googled some images for “Simeon”, and this is the one that caught my eye.